What It Is: [Amazon Product Description] Nest! Stack! Wedge! 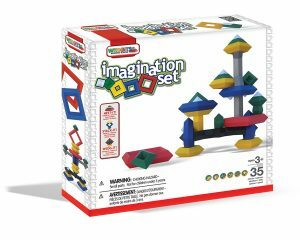 This educational building toy encourages creativity, stimulates spatial thinking and teaches geometric patterning. Five different sizes of building shapes and expansion bridges fit together to build almost anything or use the design guide to create 3-D sculptures, futuristic space craft and towering structures. Tips and techniques are also included in the design guide to get started. Winner of many prestigious awards, including the Oppenheim Toy Portfolio Gold Seal Award. Includes 35 building pieces and 1 design guide. What I Love: I love that the possibilities are endless. The manufacturer does sell WEDGit cards that one can use to try and copy designs to build or you can just use your imagination. Rating: My kids played with this starting at age 3. It continues to be a favorite at ages 9 and 11. There are many pieces, but I love that they are not so small they end up lost.